AMSOIL Ea Air Induction Filters fit most of the popular intake systems available. They provide improved cold air intake and a level of engine protection only an Ea Filter can provide. AMSOIL is currently offering Ea Air Induction Filters with varying lengths and widths. These filters have flange IDs of 3", 3.5", 4", 4.125", 4.5" and 6". Since these filters offer a universal fit, AMSOIL provides the dimension sheet below that customers can use to determine the proper filter for their applications. 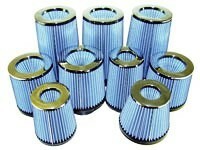 AMSOIL EaAU filters are designed to replace air induction filters on a dimensional basis only. EaAU filters do not provide connections for engine sensors found on some aftermarket induction system filters.